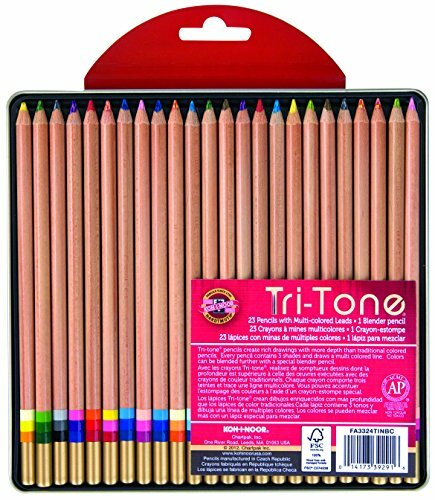 Each pencil in the Koh-I-Noor Tri-Tone Multi-Colored Pencil Set of 24 Assorted Colors contains three complementary shades and draws a multi-colored line. Create rich drawings with more dimension than traditional colored pencils. Colors can be blended further with a special blender pencil, which is included. Made from the finest Hardtmuth colors and housed in strong, durable California cedar casing. Made in Czech Republic. Bringing you the best in professional drawing and design - Koh-I-Noor.